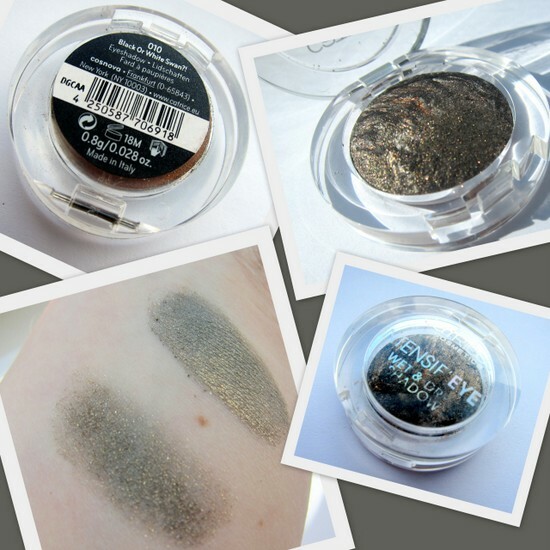 Fluffy Little Pick of the Week: Catrice Intensif'eye Eyeshadow in Black or White Swan? Bottom left: swatched both wet and dry. Part of Catrice's Nymphelia collection, these baked eyeshadows are marbled with three colours that swirl together for a multi-dimensional look. This one, Black or White Swan?, is really pigmented and sparkly so is probably best kept for a night out rather than day-to-day use. I don't own MAC's Golden Gaze, but from what I've seen and read, this doesn't seem like a million miles off. It's also similar to the marbled black and gold shadow from the Clarins Barocco palette, which I absolutely adore, except the Catrice version is a fraction of the price. These shadows cost just €4.29 and can be used wet or dry; I now own two out of the available three (check out Have You Seen Alice? here), so it seems daft not to round out the set...! Watch out Charly's Chocolate Factory, I'm coming for you soon. Have you tried out anything from the Nymphelia collection? Oh! And if you can't get Catrice in your country but would like to try it, let me know in the comments as I'd love to arrange a swap! haven't tried yet, but certainly will. thank for this share! Mine too Karen, I'm always amazed by the quality and their great duping abilities! These remind me of the Chanel AW11 colours...gorgeous! Ooo, what a great color...how interesting that it can be wet or dry...I'll have to look into it! Oooh, I bought this randomly a few weeks ago and am yet to use it. I was a bit confused by the "wet" use, but I see you've explained it above. In fairness, I should have copped that that's what it meant. It looks great wet, I can't wait to use it now! I also missed out on Golden Gaze so I'd be interested to give this a go, very pretty. I love those multidimensional colours- only really tried them in nail polish. Must look great on eyes I'd say. I've never heard of this brand! Ooh I really like the look of those! Last time I was home I stocked up on Catrice, I find it really good quality for the price!